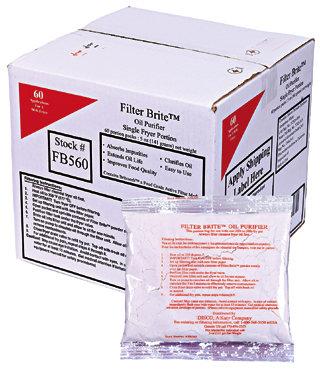 FilterBrite® Oil Purifier is available in a bulk box containing 13 lbs of powder. Inside the box is an 8 oz. (by volume) scoop for measuring the right amount of powder every time. Use one scoop when filtering a 35 to 50 lb. capacity fry pot. 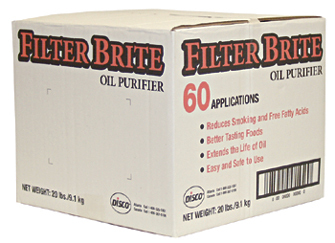 FilterBrite® Portion Packs contain our FilterBrite® Oil Purifier. The FB560 is a 3.5 oz. portion (by weight) and will filter a 35 to 50 lb. capacity fry pot.